The bus huffed and wheezed its way along the narrow lanes; it’s battered turquoise livery proclaiming that it was operated by a company ultimately owned by the German state railways. Like many a rural bus, it was full of senior citizens who’d queued neatly at Guildford’s rather dank and depressing bus station until the driver appeared with just minutes to spare. Not that it mattered. Next to no one had a fare to pay, with most of the passengers clutching their free bus passes. The driver chatted merrily to his many regulars; cracking jokes and puns to delighted coos and clucking from the grannies. The route the 63 bus took followed a line of villages once served by the former railway line, and which I’d walked through on my first section of the Downs Link several months earlier. Bramley, Wonersh, Cranleigh. Was I on a descendent of a service introduced to replace the railway line, I wondered. Only Baynards was not served, perhaps not surprisingly given the village’s diminutive size and awkward location. Funnily enough, it was the bus that had accounted for me taking nearly six months to return to Rudgwick. The 63 may well have provided a connection to all these small villages, but it had one fundamental flaw. It didn’t run on Sundays. And for several months, that just happened to be the only day of the week that I was free to head out for a walk. So when a Saturday finally came free, I headed out of London just as quickly as my legs could carry me. Which is how I found myself alighting a turquoise coloured bus in a small village, on a grey November day. According to a (no doubt utterly pointless) survey by the Halifax, in 2004 the most popular street name in the country was High Street. And second was Station Road. There are Station Roads everywhere. There’s one three minutes walk from my house, and it has something in common with it’s cousin in Rudgwick that I now walked down. Neither have a station on them any more. Rudgwick’s station and buildings have long been demolished, now replaced by a distinctly modern looking medical centre and pharmacy. But at the end of the road remains the old trackbed of the London, Brighton and South Coast Railway’s Crainleigh line. 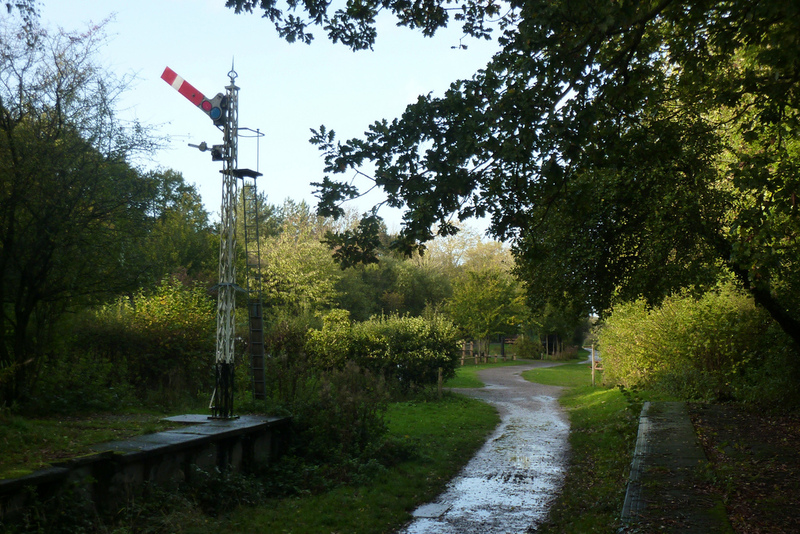 The old railway had a new role for the village residents; as a paradise for dog walkers. The path was full of people, all with a canine or two in tow. As the only person without a dog – and, indeed, the only person with a large rucksack – I felt strangely out of place. 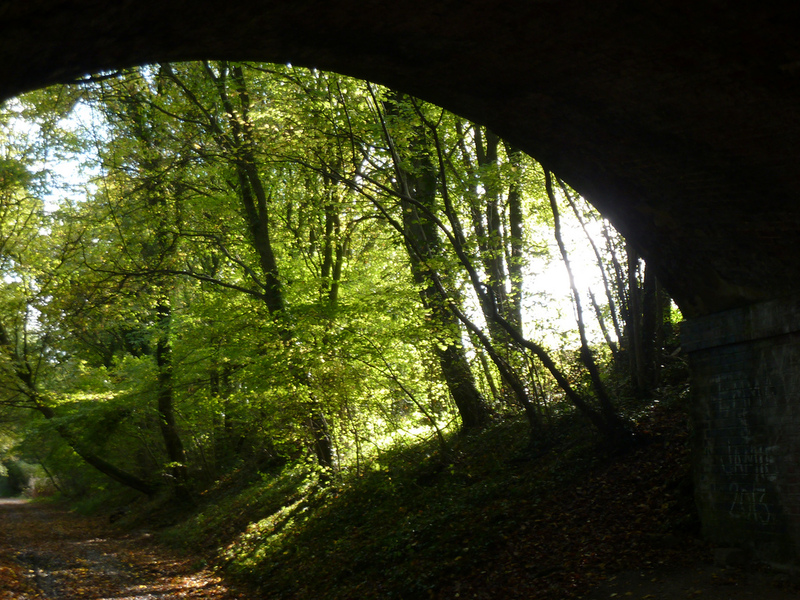 Still, the sun was shining; the bright rays streaming through the trees lining the trail. Enough to cheer anyone up who was lacking a “man’s best friend”. And just outside the village was something else to admire. There can’t be many double bridges in the country. 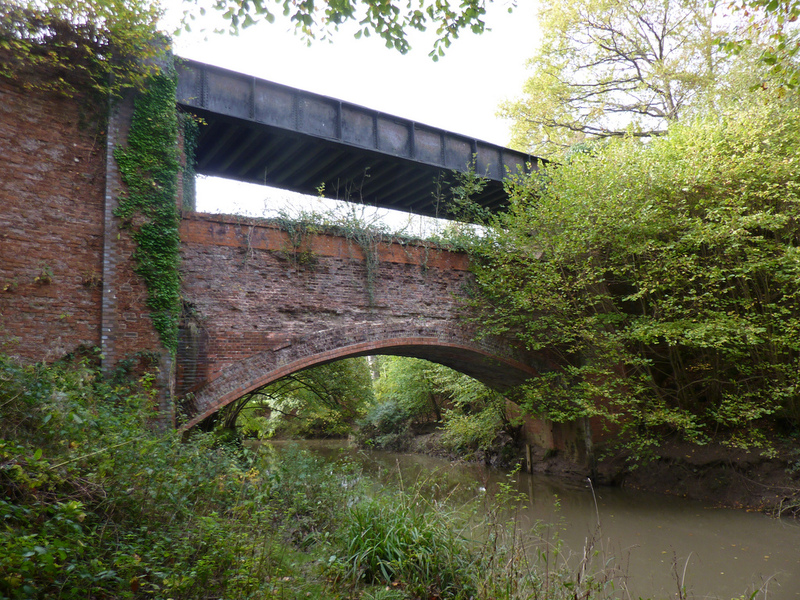 With a brick arch at the bottom, and an iron girder bridge on top, Rudgwick’s railway bridge over the certainly an interesting sight, and so different that when the council were looking for a logo for the Downs Link trail, they didn’t look much further that this one. The creation of the bridge was all due to gradients. The railway was originally built with a steep climb up into Rudgwick station; too steep for the mandarins of the Board of Trade, who insisted that the line couldn’t be opened until the gradient was lessened. So the railway company went back to the drawing board, and began the expensive process of raising all its embankments in order to make the gradients more acceptable. But this left the brick bridge outside the village three metres too low. Rather than demolish the original bridge, the railway engineers implemented a cheaper solution. A new iron girder bridge was simply placed above the brick arch, with the latter being used as a flying buttress to provide support. Naturally, from the old trackbed it’s impossible to see the result, but some thoughtful soul had built a small viewing platform, so naturally I went down the set of rather muddy, leaf filled steps to take a look at this rare of rare railway sights. Returning back to the path, I found that all of a sudden, cyclists were everywhere. Ping ping, went their bells. Whoosh, whoosh went the air as person after person clad in bright yellow lycra zoomed down the track. One large group, complete with eight children in tow, raced past me at speed, followed by another set, and a third. And then almost as soon as they’d all arrived, I was alone once more, contemplating the bird song and squelching through the mud. Slinfold was the next stop on the line, but after closure the station’s single platform and goods yard were demolished, and these days are home to a caravan park; all closed up for the season with only the occasional power point providing an indicator what went on there at summer. The old trackbed had gone too, so the trail took a small diversion down a neighbouring lane before heading down an alleyway between modern houses, built on the old railway land, before rejoining the old embankment. Half a mile away though, a bigger diversion was needed. A warning sign told all that would read it that anyone following the old railway line all the way to Christ’s Hospital station would face a dead end, and would need to come straight back. This seemed at odds with my Ordnance Survey map which seemed to imply otherwise, showing a path that ran all the way to the station and beyond. If the sign was wrong and the map correct, I could save myself a mile of trudging down busy roads. And if the map was wrong – which, to be honest, seemed more likely – I’d have made a pointless detour. I stood for a moment, contemplated my options before saying “Stuff it” and heading off down to a dead end. From the state of the path, it was obvious that not many people bothered to follow this bit. It was muddy and narrow, and frequently blocked by uprooted trees; no doubt the result of recent storms that had battered the south of England. Curiously a picture frame dangled on the branches of one tree, whilst several metres away was the back of the frame. I never did find out what was once in the frame. My hopes that my detour wouldn’t be in vain were lifted as I passed two hikers and a jogger, but were quashed again as I hit another sign telling me firmly to retrace my steps. Nearby a train rumbled overhead on the still-open railway line to Horsham, and the path seemed to continue on. In for a penny, I thought, and carried on. 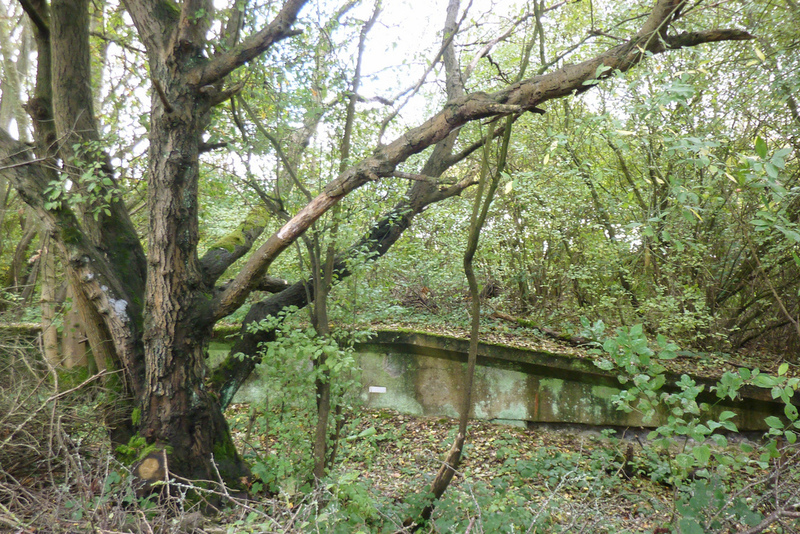 Just a short way on, I found something of railway history: the gently decaying remains of Christ Hospital’s low level platforms, which were now surrounded, nay, completely covered, in the undergrowth. Once there were three tracks here, with trains shuttling between Guildford and Horsham. It didn’t last. On 14 July 1965 Christ’s Hospital’s low level platforms saw off their final service; sent off to a chorus of Abide By Me, as the train pulled away. Within weeks, the platform buildings had been unceremoniously demolished and left for nature to reclaim. Beyond, a rough path seemed to continue, but with no indication where it went – if anywhere – I reluctantly went back to the signpost, belatedly obeyed its instructions, and prepared myself to walk down the main road..
Christ’s Hospital might strike you as an odd name for a station. Did Jesus ever wander around West Sussex? Was he a doctor for a few years, before popping back to Galilee? Actually Christ’s Hospital station gets its name from a school which it was built to serve. 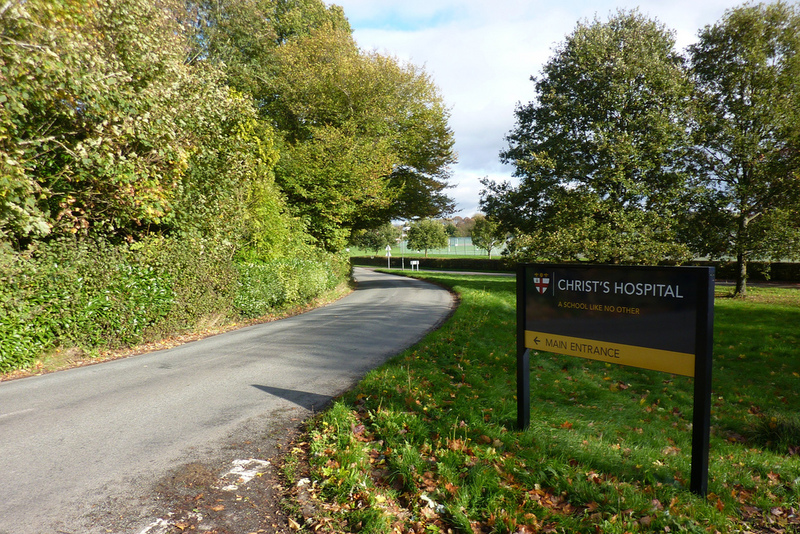 A school named Christ’s Hospital. Originally founded in 1546, the school was based in Newgate Street, London and created to educate the capital’s orphans; the word “hospital” often being used at the time to describe hostels and almshouses. Today it remains an independent school, although offering scholarships and bursaries to those less able to pay its fees. For several years the school contemplated getting out of London, in order to give its pupils a better life, and in 1902 it finally did. In preparation for the move, the railway company took the opportunity to invest in a new station, which it did in style, creating a lavish facility, with seven platforms and an impressive array of waiting rooms and canopies. The whole thing had been built to serve the large number of pupils that the railway company expected to be commuting through it on a daily basis, blissfully unaware that the school was planning to only accept borders. Railway company plans for a large housing estate nearby also never came to fruition after the school purchased most of the land. After all, what was the point in moving to a rural setting if someone was going to build houses everywhere? The result was a station way out of proportion with the local demand, and almost inevitably the station was substantially reduced in size following the Beeching report. From seven platforms, the station went down to five, and despite protests, the impressive Italianate buildings were swept away. The Downs Link passed by the school’s boundary, staying a respectable distance from the buildings, passing along the fields instead, before joining the trackbed of the old Steyning as it made its way towards the coast. “Walkes, dogs, cyclists and horse riders welcome,” proclaimed a sign at the Bax Castle Inn, on the outskirts of Southwater. I looked at my watch and sighed. No pint for this Downs Link walker if I wanted to get to Henfield before the sun went down. Besides, I didn’t have a horse. In the village the old line had been swept away by redevelopment. Houses were slotted in here and there, and the old station had disappeared under a recent project to re-route a main road. And just on the other side, the trail headed along a rough track instead, leaving the old embankment to its new life of brambles. The track skirted the edge of the Southwater Country Park, redeveloped from the old claypits that once powered the Southwater brick works. Where once industry had toiled, now there was the sound of leisure; the air filled with the sound of children running and laughing. I was alone though. Kayaking and pedal boating were clearly of more interest than walking. Rain had threatened to fall all afternoon, and by the time I reached the car park in the village of Copsales, it was chucking it down. There seemed to be no one around. No noise, no people. But then, this wasn’t much of a surprise. The local villages were small, which was one of the reasons the train line hadn’t drummed up much passenger trade. Indeed the only reason that the Steyning Line had been built as a double tracked line was the promise of freight trade from places like the brick works. Nearby West Grinstead was a perfect example of one of these tiny communities. 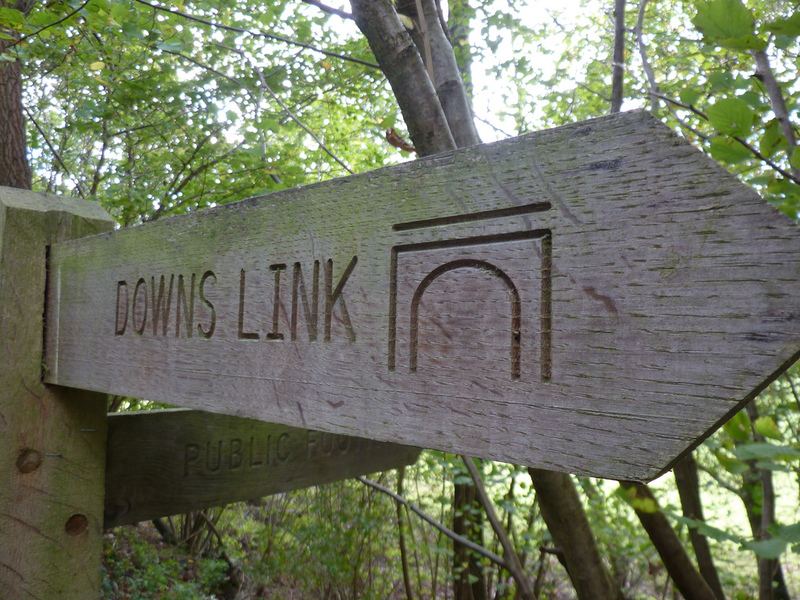 A tiny place, but one that now has a special place in Downs Link, for it is home to the Downs Link visitor centre. 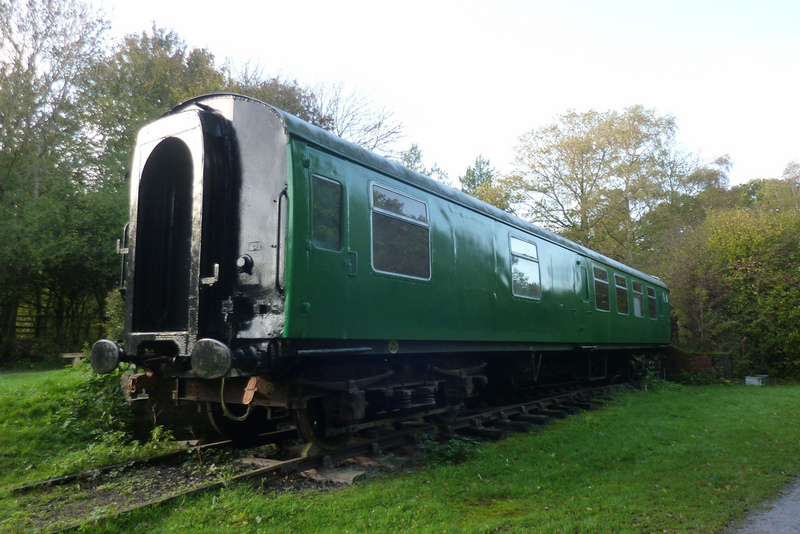 Housed in an old railway carriage, painted in the green colour scheme of the Southern Railway, the centre lets you pop in and found out all about the Downs Link. And probably more. Although as it was only open on Sundays, all I got to see was a locked door. If there had been any disappointment at how little railway memorabilia remained on the Downs Link, then all was forgiven here. As well as the old coach, West Grinstead’s former station was amply decorated by old gradient signs, large station signs and a flower bed made out of what looked like old railway sleepers. But by far the best feature sat on one of the old platforms where there was an old semaphore railway signal. And if that wasn’t enough, there was a leaver that you could pull to change the signal’s setting. Once I’d found that out, there was no stopping me. For five minutes I stood there, pulling the well oiled leaver, watching as a series of pulleys and wires quietly changed the aspect of the signal. Danger. Clear. Danger. Clear. If it wasn’t for the fact that the sun would be setting in a few hours, I may have stayed there all day. Reluctantly I pulled myself away and headed on to the village of Partridge Green which offered similar torment in being the home to the Darkstar Brewery and it’s brewery tap, The Partridge public house. Much as I fancied a pint of Hophead, or maybe an Espresso Stout, there was no time. With the hills of the South Downs coming into view, bathed in the golden light of the sunset, I arrived at Henfield, and pulled myself off the trail in order to find my bed for the night, and to finally get some of that beer stuff at a nearby hostelry. But not at the Railway Tavern, the pub which once sat next to the railway station. With the railway gone for many years, the owners had decided to rebrand. And so it was that this prestigious establishment now had a giant feline on its pub sign, in its new guise as the Cat and Canary. Next time: it’s hello to the South Downs Way, and then to the sea-side as the Downs Link’s journey comes to an end. First Published: 19 February 2014. Last Updated: 16 November 2014.